Care of the elderly is in a state of “calamitous, quite rapid decline”, a leading charity boss has warned, with hundreds of thousands fewer people receiving care than five years ago. More than £1bn has been slashed from councils’ social-care budgets in England since 2010, despite an increase in the elderly population, meaning thousands who would have received help with basic tasks such as getting out of bed or taking medication no longer get support, AgeUK said. Caroline Abrahams, it’s director, said the cuts were also harming the NHS, with hospitals struggling to discharge patients quickly into home or community care – a major factor behind the extreme pressure faced by hospitals this winter. The problems of “exit block” leads to delays in admitting patients from emergency departments, because beds are taken up by frail elderly people waiting for a community-care package. It is believed to be a major factor contributing to this winters’ 10-year highs in A&E waiting times. AgeUK said the number of older people receiving home care has fallen by a third since 2010, while places in day-care centres declined by two-thirds. More than 40 per cent fewer people receive equipment and adaptations such as rails and stairlifts. Just under 9 per cent of over-65s – 850,000 people – receive any support from councils, down from well over a million five years ago. The Department of Health, said that, in total, an extra £1bn had been given to local councils to help to protect social-care services this year, adding that councils were responsible for determining their own budgets. The Government is to give £25m to 65 councils where delays in discharging elderly patients from hospitals are the most severe. This entry was posted in Uncategorised and tagged A&E, budgets, Care in the Community, elderly care, elderly people, exit block, hospitals, social care by Focus on Disability. Bookmark the permalink. 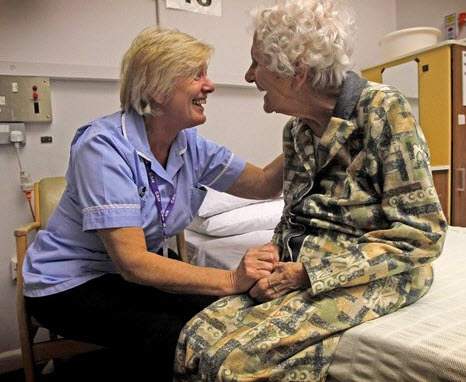 Sad when I was a district nurse my patients looked forward to their day centres. This was the only form of social interaction some of them had ,including a hot meal. What can we do to help.????? Combine housing, work and health care. Apartment buildings, with clinics on the store front level, designed for people with specific needs or disabilities provides a headquarters, home calls instead of hospital beds, and a way to work with peers, near medical equipment and caregivers, on issues that matter. Rarely will medical transportation, hospitals or nursing homes be needed then.